Most of us may associate threading with a sewing machine, so the idea of a threading hair removal method may seem a bit odd. But in fact, hair removal by threading is an old technique, originating in the middle east. Explaining how the threading method works can be hard to describe in words. In essence, the idea is to twirl thread between your fingers, and catch the hairs in the midst of twirling.... so that they can be plucked as a group. So here are two short videos to give you a demo. When I watched this video, two things really stood out for me. One is the that model has a nice high pain threshold. Remember that each of those hairs are being plucked out en masse with each twirl of the thread. And there IS a bit of a sensation. The second thing that caught my eye was that the hair removal technician put the thread in her mouth at one point, before doing the hair removal. I don't know about you, but I found that to be a bit less than hygenic. I don't know about you, but I found that to be a bit less than hygienic. As you can probably guess by watching these video, this hair removal method definitely takes practice. If you're having the threading done for you, you'll want to ask lots of questions about their experience. How long have they used threading as a hair removal technique? You may also want to look for indications as to how well they try to manage the comfort of their clients. This hair removal technique can be a bit painful at the hands of a newbie. Ideally, your hair removal specialist will take your comfort into consideration. 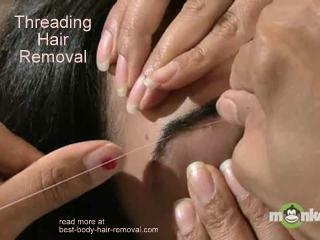 And, of course, like most hair removal techniques, threading is not a permanent hair removal solution. Which, like always, is why I recommend electrolysis for hair removal instead.